This project is funded through the Rice Promotion Board through producer check-off dollars. The cultivar CL151 has become a popular variety for Southern rice production because of its high yield potential and red rice control. 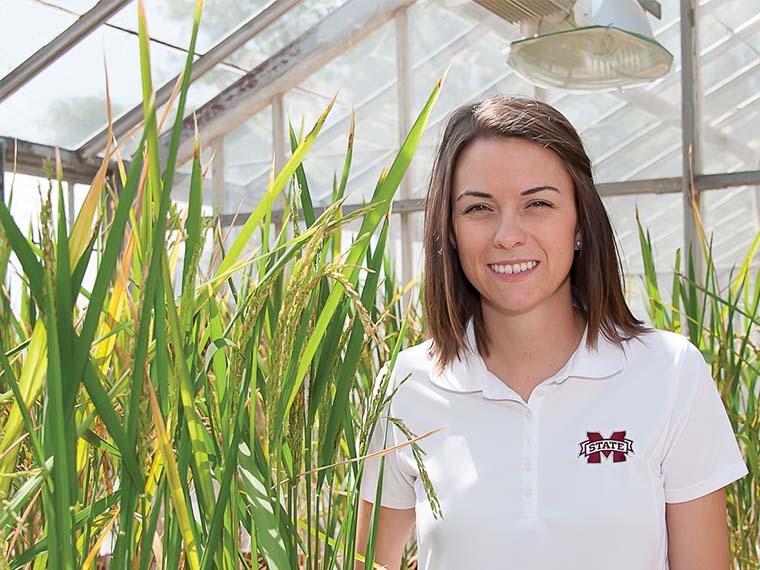 On average, 10 percent of the planted rice in Mississippi was planted in CL151 during 2012–2013. Expansion of CL151 has been tempered because of its propensity to lodge, which can decrease harvest efficiency, grain quality, and yield. Corbin conducted a study to evaluate the effectiveness of Palisade® (trinexapac-ethyl), a plant growth regulator, in controlling the lodging problem for CL151. The study was conducted in 2012 and 2013 on a Sharkey clay soil, a Dundee silt loam, and a Commerce silt loam. The experiment consisted of a combination of treatments: applications of Palisade® at rates of 0, 1.37, 2.75, or 5.5 ounces per acre; all nitrogen applied preflood or 75 percent applied preflood and 25 percent applied at panicle differentiation; and Palisade® applied at panicle differentiation or panicle differentiation plus 14 days. The study measured lodging (percent of the plot and severity), plant height, and grain yield. For the Dundee silt loam in 2012, the lodging rate was greatest when no Palisade® was applied. The rate of 1.37 ounces per acre reduced lodging to less than 2 percent. Likewise, lodging was much more severe without Palisade® than when the highest rate was applied. Plant height decreased as the rate of Palisade® was increased; it was reduced by 18 percent with the highest application rate. Plant heights were greatest when 100 percent of nitrogen was applied at preflood. Grain yield decreased from 12,165 pounds per acre with no Palisade® application to 9,588 pounds per acre when the highest rate was used. In 2013 on the Sharkey clay soil, lodging was highest when no Palisade® was applied and nitrogen was applied at 100 percent preflood. Lodging was much more severe without Palisade® than when the highest rate was applied. On Sharkey clay and Commerce silt loam soil types, plant heights were greatest when no Palisade® was applied and shortest when the highest rate was applied at the panicle differentiation plus 14 days. Also, plant heights were greatest when nitrogen was applied preflood. On Commerce silt loam, grain yield was 11,334 pounds per acre without Palisade® and decreased to 10,543 pounds per acre when the highest rate was used. On the Sharkey clay soil, grain yield was 11,213 pounds per acre when nitrogen was applied preflood and decreased to 10,420 pounds per acre with a split application of nitrogen. In summary, these points of data suggest that Palisade® is effective in reducing plant height, which in turn can reduce lodging incidence. However, it is also evident that higher rates of Palisade® can potentially have a negative impact on yield.